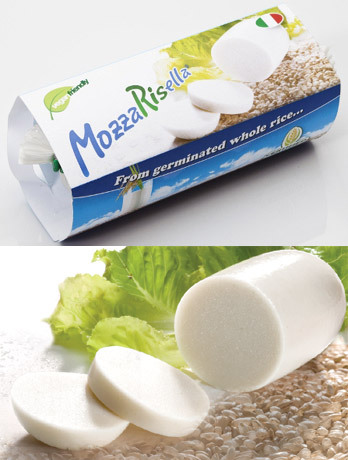 Mozzarisella is a delicious vegan cheese that’s made with germinated whole rice, made completely without milk, lactose or other dairy normally used in cheeses. It's certified organic and free from GMO ingredients, gluten and soy, making it a great option for those with allergies. It also contains no artificial colors or flavors, and has a true flavor and texture extremely similar to fresh mozzarella cheese. Whether you use it to make the best vegan pizzas or simply slice it with some basil and balsamic vinegar for an amazing caprese appetizer, this vegan cheese alternative is going to be a new favorite! Mozzarisella is available in two varieties: Original Mozzarella and Smoked Mozzarella. Both varieties are avaiable in 200g (7.05 oz.) packages. Both flavors are $8.99 each. I love cashew-based cheeses, so I was hesitant to try this product. It definitely has the texture of mozz, and the flavor is mild and -- more importantly -- not offensive at all. I liked the bite it had. I sliced it, sprinkled a little salt on it and warmed it up atop some already cooked vegan chicken patty with pasta sauce. From Lisa Watkins of Clayton, North Carolina on 9/14/2018 . Wonderful product!! I have been eating vegan for well over a year now and in that time searching for a cheese comparable in taste to dairy cheese. MozzaRiella is that cheese! I have had it cold and hot, the flavor holds up and never disappoints. From Anonymous of Spring lake, New Jersey on 2/24/2018 . As a family with anaphylactic dairy allergy plus vegan we have tried all vegan cheese options THIS IS THE BEST! It can be eaten both cold and hot , when broiled it bubbles and melts completely ! My mother in law from italy loved it! From natalia scollo of islip, New York on 7/6/2017 . This is closest to real fresh mozzarell that you are going to find. I'm Italian, I know. I made caprese with this and it was so authentic. I got the spreadable kind and the texture was perfect. This will be a staple in my home for sure.